Welcome to part two of Shiny Shiny’s summer cycling round-up! This time I’ve tried and tested some fantastic accessories, and again, they’re all chosen with safety and style in mind where possible. 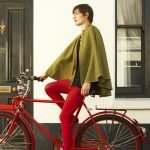 Click here to read part one, which is a round-up of bright and colourful clothing for female cyclists. This item is first on the list because of the way it’s dramatically changed my commute – for the better! It’s hard to overestimate the usefulness of a pannier, and this beautiful yellow bag shows up brightly and boldly both by day and night. It has reflective strips for added safety at night, as well as hooks around the edges for attaching lights, and is made from a strong fabric which feels very tough. The first day I used it, its waterproof quality was tested in a downpour, and sure enough my items were still bone dry when I opened it again. 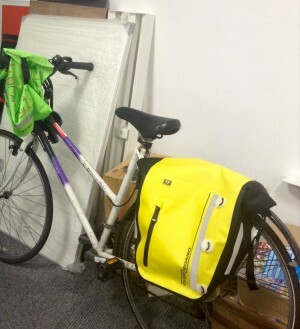 I’ve continued to use the pannier on a daily basis. Best of all, its universal attachments means it can be affixed and removed in two seconds from almost any bike, so it’s perfect for transferring between friends. It has an impressive 17 litre capacity, so you can easily fit a laptop, backpack or a few bags of shopping inside. The Overboard pannier on my old bike – it shows up really well in the dark as well as during the day. 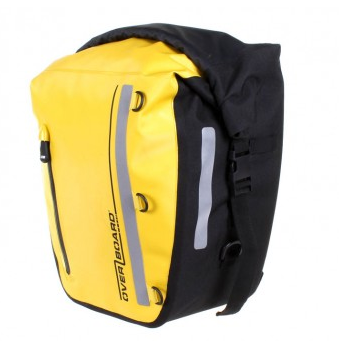 Overboard Classic Bike Pannier is available to buy from overboard.co.uk. A comfortable seat is undoubtedly a hugely important factor when cycling – after all, you’ll potentially be spending hours on it. 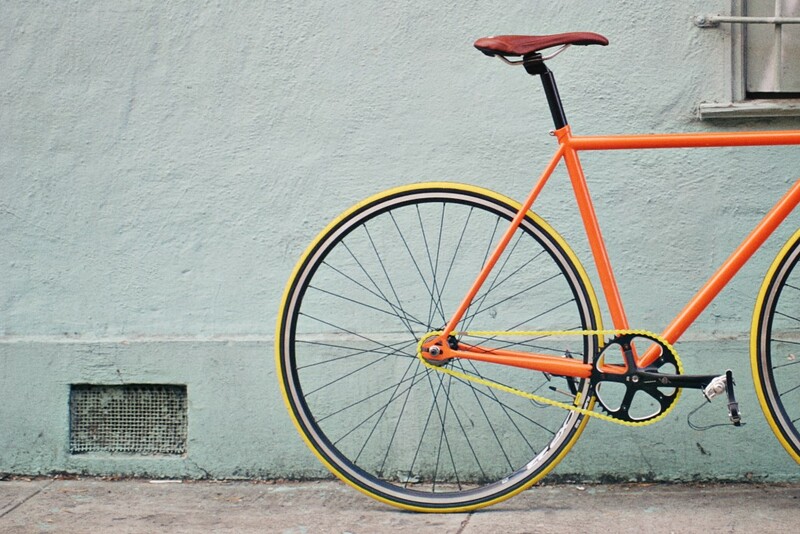 Research by YouGov found that a staggering 88% of cyclists cite saddle comfort as the most important factor when choosing a bike – but you don’t have to ditch your old bike entirely to get a nicer riding experience. This fantastic saddle – the Classic Freeway by Selle Royal – can be fitted easily to almost any standard bicycle, is very comfortable, and at £29.99 is a worthy investment. 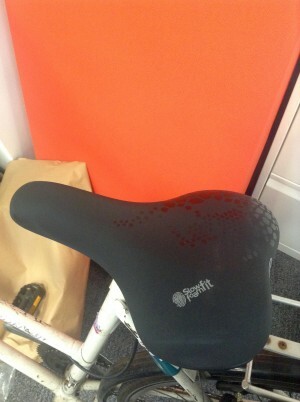 Before I tried out this saddle, I was using my bike’s original foam one which frankly felt like a rock. So obviously, I was always going to be impressed by this: the Classic Freeway is made of ‘Slow-Fit Foam’ which moulds to your body the way a memory foam mattress does, and guarantees an even distribution of my body weight, meaning I get much less ‘cold-bum’ due to increased blood circulation. I felt the difference immediately. Not only this, but the hits and vibrations of rough roads have been much less noticeable with the saddle cushioning my rear! It’s truly changed my cycling experience for the better. As you can see, the seat has some give, feels like a bike version of a memory foam mattress and takes just a few minutes to attach. 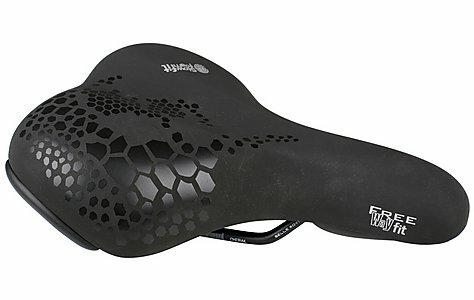 Selle Royal Classic Freeway Fit Foam – Female Saddle is available from Halfords.com. This fabulous backpack is a stylish alternative to a pannier, for those who prefer backpacks or for days when a backpack is more useful. 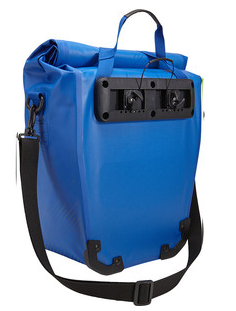 It comes in several bright colours which are great for summer, and features a very handy raincover and anchor loop for an LED light – particularly useful for cyclists. 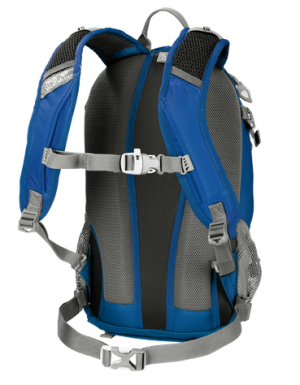 I’ve found that this backpack is best worn close to the back, as it has a central ventilation channel and air-permeable back cushioning which noticeably keeps you cool as you’re moving. 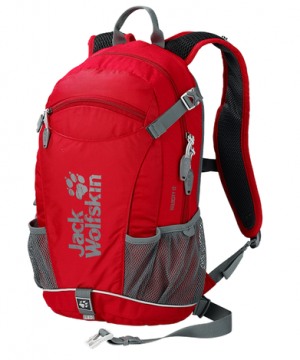 It features the Jack Wolfskin trademark and is a really fantastic piece of equipment for cyclists. Jack Wolfskin Velocity 12 bike rucksack is available to buy at Jackwolfskin.co.uk. This is a great 0.75 litre bottle from Jack Wolfskin, ideal for hot summer days when you need a bit more water than usual. It’s made of a grippy material so can be grabbed with one hand while on the go, and it can be fixed to a rucksack using the carabiner on the cap. 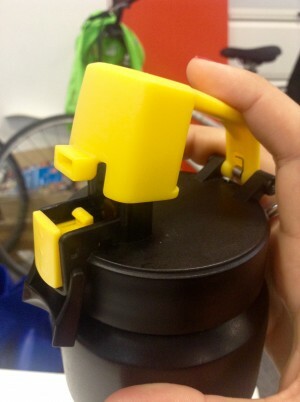 The closure also is very secure and prevents spillage. The Jack Wolfskin bottle is made of a grippy material and has a good closure to prevent spillage. Jack Wolfskin water bottle 0.75 litre is available to buy from Jackwolfskin.co.uk. 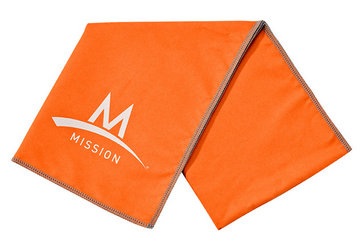 Used by the unstoppable Serena Williams, this towel is made from patented technology and cools your body instantly. It’s machine washable, easy to use and comes with a portable plastic container, so it’s ideal for taking on cycle rides. It works by being soaked in water, then keeps cool for an impressive couple of hours – so wet it before you go out and use when necessary! 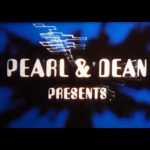 Check out this YouTube video for a tutorial, and for more info about the technology. 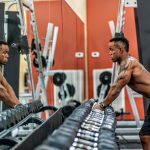 Enduracool is available to buy at missionathletecare.com. 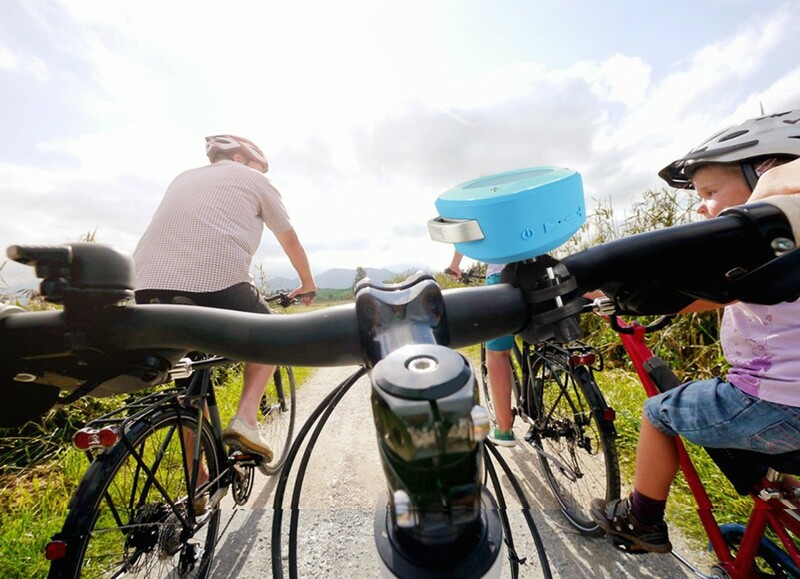 This is a fantastic little speaker, perfect for events like Critical Mass or to take on a longer ride in the countryside. 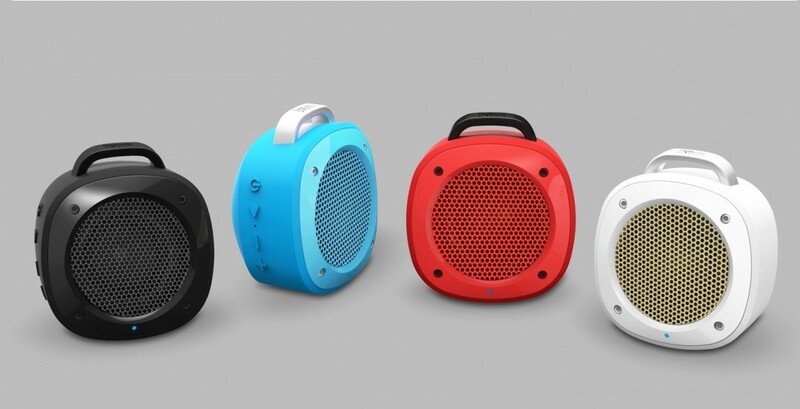 It works with Bluetooth, and comes with a suction cup and resonating technology that turns any hard flat surface into an extra subwoofer, so the bass is noticeably amplified. I’m also really impressed with the sound quality of this speaker – it produced a pretty impressive boom when attached to my handlebars (using the suction cup or the bike mount). Its splashproof quality means it still sounds great during the rain, too. Divoom Airbeat-10 is available to buy from Amazon.co.uk. 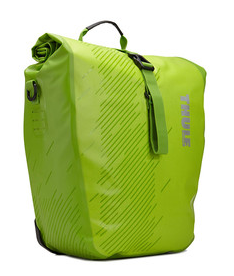 Swedish company Thule has an amazing range of useful cycling items, and this pannier is of the highest quality. Featuring highly useful inner pockets and reflective elements on both front and sides for safety, they also come in pairs, which is handy as it balances the weight across the bicycle a bit more. The attachment system, with lower magnetic connection, is simple to use, secure and vibration-free, and works well with virtually any bike rack. The best thing about these panniers is the integrated grab handles and detachable shoulder strap, which means there are multiple carrying options for when you remove them from your bike. They come in bright summer colours of lime green and cobalt blue, and have 24 litre/14 litre packing volume depending on the size you want. 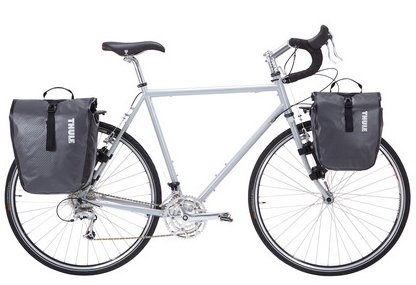 Thule Pack ‘n Pedal shield panniers are available to buy at Tredz.co.uk. Ideal for those with multiple devices, this is a must-have when out on a long cycle. With many ports and LED lights displaying charge status, it’s handy without being cumbersome and is compatible with power-hungry devices from Apple, Blackberry, HTC, LG, Motorola, Nokia, Samsung, Sony and more. 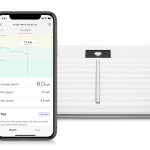 Best of all, the IGo Charger is not any regular portable charger: it is the only portable battery with pass-through power, meaning it charges its internal battery and your device at the same time. Genius. The IGo Charger Anywhere Portable Wall and Battery Charger is available to buy from qvcuk.com.